You'll often find plantains, a slightly larger, close relative of bananas, served fried. Although similar in sugar and potassium content to bananas, plantains contain much more vitamin A and copper. They provide you with a significant amount of your daily recommended intake, or DRI, of several nutrients your body needs to function. One plantain contains 218 calories , 205 of which come from carbohydrates. Nearly half, or 26.9 grams, of the 57 grams of total carbohydrates in one plantain come from sugar. One plantain also contains 4.1 grams of fiber, which is 15 percent of the DRI. Fiber is an important addition to a healthy diet as it assists in the digestive process by moving food through the intestines and colon. Many fruits are high in potassium, and plantains are no exception. One medium plantain contains 893 milligrams of potassium, which is 19 percent of the DRI. Potassium aids in numerous cellular functions including the formation of proteins from amino acids and the break down of carbohydrates into energy. Potassium-rich foods are an important addition to the diet, as potassium is necessary for proper function of all tissues and organs. One plantain also supplies 16 percent of the DRI for copper. Copper is important for red blood cell production and is important for nervous system, bone and immune system health. A diet low in copper can lead to conditions such as anemia and osteoporosis. One plantain provides more than 44 percent of the DRI for vitamin C. Vitamin C aids in iron absorption and also strengthens your connective tissues. Plantains also contain 1.1 mg of iron, which is 14 percent of the DRI for men and 6 percent for women. While this is not a large amount of iron, the vitamin C content in the plantain will assist in its absorption. Although plantains are low in most B vitamins, one medium fruit supplies 41 percent of the DRI for B-6. The body needs B-6 to produce hemoglobin, which is the part of the red blood cells that transports oxygen throughout the body. B-6 is also important for immune and nervous system health. 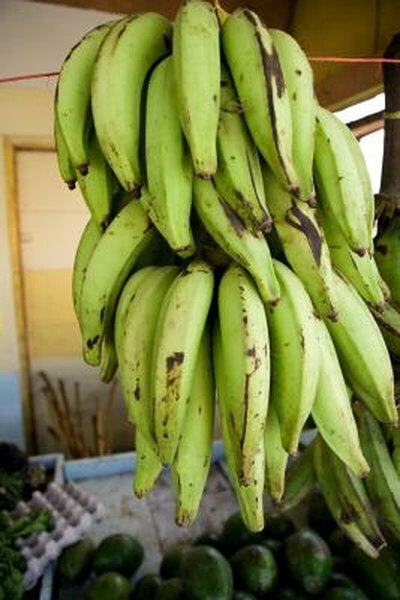 One medium plantain provides 14 percent of the DRI for vitamin A for women and 11 percent for men. This vitamin A comes from the 818 micrograms of beta carotene contained in one plantain. The small intestines convert this beta-carotene into vitamin A, which can then be stored in and used by the body.